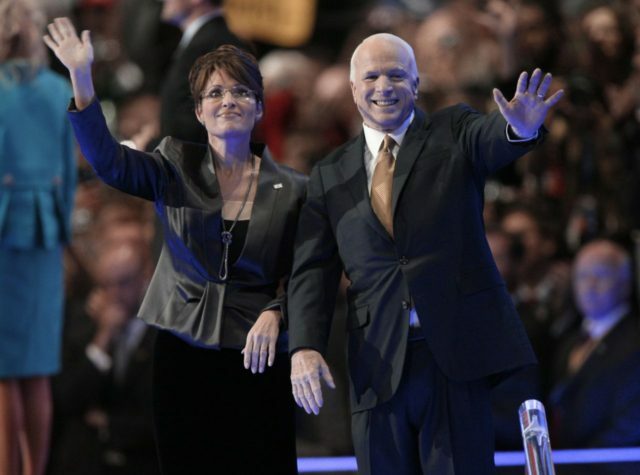 Sen. John McCain (R-AZ) reportedly regrets choosing former Alaska Governor Sarah Palin as his running mate in 2008. Palin galvanized conservatives and working-class voters who were fed up with both political parties when she was put on the ticket, and she was the only reason McCain even had a fighting chance of defeating Barack Obama in 2008—the McCain-Palin ticket took a two-point lead after the Republican National Convention. Voters ultimately vote for the top of the ticket, though, and McCain lost the election in large part because his incompetent and in-over-their-head advisers like Nicolle Wallace and Steve Schmidt decided to infamously go “all-in” by suspending his campaign during the financial crisis. McCain’s hacks, who allowed McCain to go to White House meetings about the financial crisis without being fully prepared or briefed about TARP (Trouble Asset Relief Program), somehow managed to make a freshman Senator seem more presidential than the distinguished war hero and veteran legislator. After the 2008 election, Palin gave a voice to blue-collar conservatives who were ignored by the GOP establishment that had nothing but disdain and contempt for them and the issues they cared about like illegal immigration. The former Alaska Governor also made it possible for an economic nationalist and outsider candidate like Donald Trump to eventually crush the Republican establishment in the 2016 primaries and then shock the elites in the bipartisan permanent political class in the general election. The Republican establishment, sensing the existential threat that Palin represented long before Trump’s rise, promptly tried to to everything to undermine her influence, previewing what they would try to do to Trump eight years later. Last year, I highlighted nine prominent ways in which Palin was a trailblazer for Donald Trump’s rise, and former President Barack Obama, whose head Palin lived in rent free for much of his time in the White House, also observed that there is a “straight line” from Palin to Trump.